Brasserie Bread, originally founded in Sydney, is passionate about its quest to bake true artisan bread, and has combined expert training, skill and a love of delicious organic ingredients to create Australia’s leading sourdough bakery. The bakery is fast establishing a reputation in Melbourne for supplying premium artisan products to top food industry professionals, and has emerged as Australia’s leading wholesale bakery. Brasserie Bread’s delicious baked goods are also on the menu at its popular Banksmeadow café and Domestic Terminal 2 in Sydney; Brasserie Bread’s delicious pancakes, toasts and other treats frequently appear on the Good Food Guide’s ‘Best Breakfast’ lists. 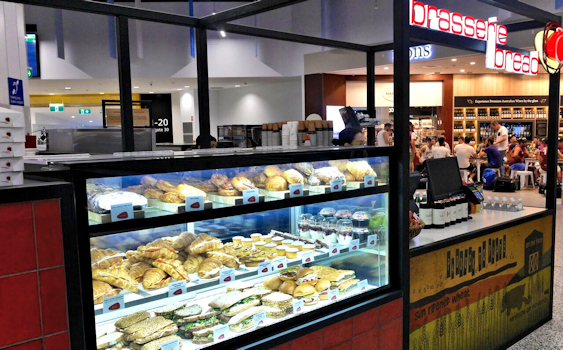 Now, ARE has brought Brasserie Bread Café to the new Domestic Terminal 4 at Melbourne Airport, with premium products that give customers the great taste and atmosphere of the original café.